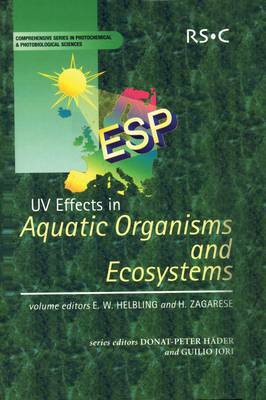 This book offers extensive coverage of the most important aspects of UVR effects on all aquatic (not just freshwater and marine) ecosystems, encompassing UV physics, chemistry, biology and ecology. Comprehensive and up-to-date, UV Effects in Aquatic Organisms and Ecosystems aims to bridge the gap between environmental studies of UVR effects and the broader, traditional fields of ecology, oceanography and limnology. Adopting a synthetic approach, the different sections cover: the physical factors controlling UVR intensity in the atmosphere; the penetration and distribution of solar radiation in natural waters; the main photochemical process affecting natural and anthropogenic substances; and direct and indirect effects on organisms (from viruses, bacteria and algae to invertebrate and vertebrate consumers). Researchers and professionals in environmental chemistry, photochemistry, photobiology and cell and molecular biology will value this book, as will those looking at ozone depletion and global change.